There Is No ‘Why’ In Forgiveness is a response to the recent church shooting in Charleston, South Carolina and how the families who lost loved ones were able to find grace in their loss through forgiveness. Listening to NPR recordings of the families’ voices as they struggled and ultimately succeeded in forgiving the shooter inspired Rosenberg and Covarrubias to explore the “structure of their forgiveness” and attempt to create a physical presence that could represent such a complex emotional state. 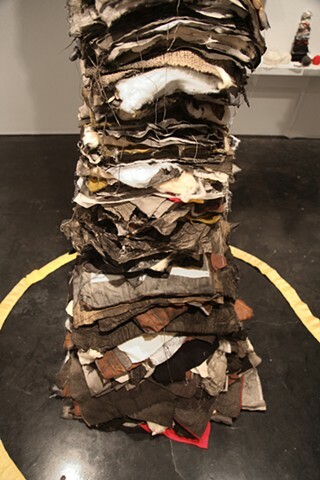 As artists, they wanted to know what forgiveness looked like, how it felt, sounded, tasted and smelled. 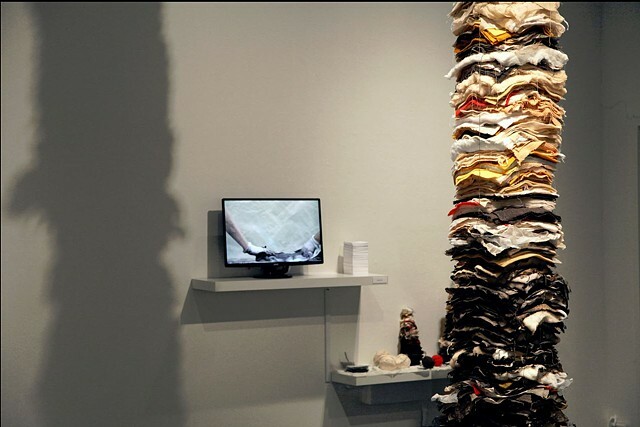 Their installation offers the beginnings of an answer and involves multiple dimensions – 1D text cards, 2D paper and textiles, 3D layered columns, 4D video showing the compression of those layers and the 5D emotional power of their chosen subject. 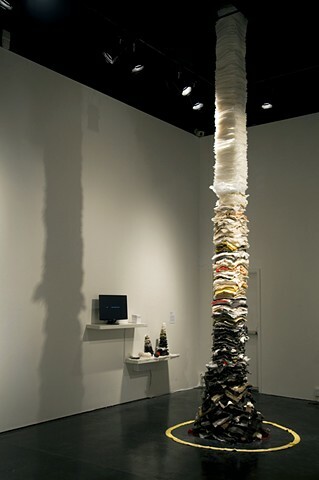 The installation suggests that forgiveness begins dark and heavy, uneven, and awkward at the foundation, and then over time, it rises slowly upward, layer by layer. 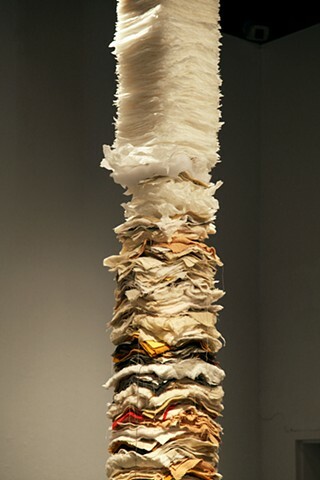 As it rises, it becomes lighter, more transparent and reflective until it achieves what can be considered “a state of grace.” This single column of layered textiles and tracing paper stretching up to the highest point of the gallery (and beyond) represents both the structure and the power of forgiveness. What Rosenberg and Covarrubias have learned in the process is that if we hold onto violence and hate it benefits no one – it only extends that violence and hate to others and that by forgiving others, we also forgive ourselves. 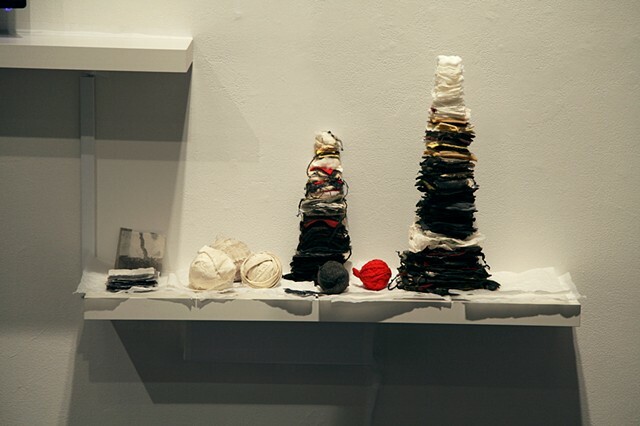 There Is No "Why" In Forgiveness was on display as part of the exhibition Expanding Dimensions: CCA 2015 Faculty Exhibition curated by Mara Holt Skov, at the Tecoah Bruce Gallery in the Oliver Art Center at California College of the Arts, Oakland, California, from August 24 to October 7, 2015. 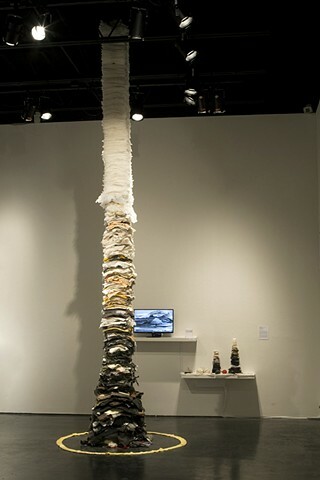 There Is No "Why" In Forgiveness was exhibited along with a video entitled Studio Process for TIN"Y"IF 2015 depicting the layering of materials used throughout the installation. 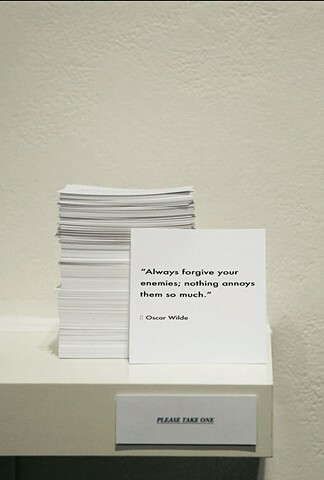 Also on display as part of this piece in the exhibition were maquettes, various items displaying alternative forms considered during the project, and an element entitled Forgive Yourself: Quotes & News URLs on Forgiveness. 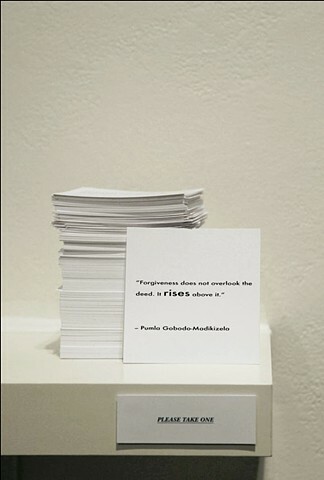 This was a stack of notecards inscribed with various quotes and news article titles with URLs to stories about forgiveness that gallery visitors were invited to take with them.